Use fresh, sweet figs that pair perfectly with the tangy pepperiness of blue cheese. Figs come in many varieties; the color of the fig varies by variety, and it is not necessarily an indication of ripeness. Dry figs are a wonderful alternative if fresh figs are not available. Rinse and pat dry the lettuce and place in a salad bowl. 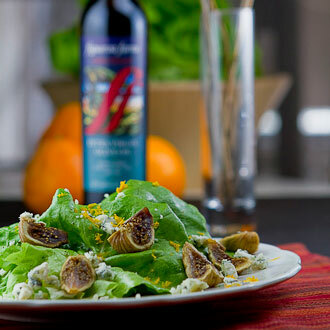 Arrange the quartered figs on top of the lettuce and sprinkle with the crumbled blue cheese. Make the vinaigrette: place the diced shallots, orange juice, orange zest, and salt and pepper in a bowl. Slowly whisk in the olive oil. Pour over the cheese and figs.